Less than 24 hours after Google unveiled a new driverless car prototype, the CEO of disruptive ride-sharing service Uber has admitted he is envisioning the day when his cars won't need a wheel man either. Speaking at the Code Conference, Uber's Travis Kalanick said the prospect of a driverless fleet of vehicles could create an environment where commuters choose not to own cars. Kalanick, whose firm has been the subject of recent protests from London cabbies over its disputed imposition, said driverless cars would lower cost for passengers, making calling a car cheaper than owning one. "The reason Uber could be expensive is because you're not just paying for the car - you're paying for the other dude in the car," he said. "When there's no other dude in the car, the cost of taking an Uber anywhere becomes cheaper than owning a vehicle. So the magic there is, you basically bring the cost below the cost of ownership for everybody, and then car ownership goes away." In a statement that's sure to further ignite the ire of protesting licensed London black cab drivers, Kalanick went on to offer little sympathy for the drivers that'd be ditched in such an event. "I'd say 'Look, this is the way of the world, and the world isn't always great.' We all have to find ways to change with the world," he said. The London Taxi Drivers Association has taken umbrage with how Uber calculates passengers' fares. It is listed as a private hire company, which prevents the company using meters. Uber drivers negotiate fees with passengers using a smartphone app, but are aided in that by a device which the LDTA says is "set up to be a meter," something Uber denies. 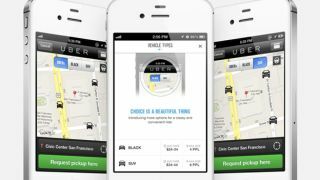 Either way, it appears Uber is here to stay, especially when recent reports have suggested the firm is acquiring funding on an astronomical valuation of $17 billion (around £10.1b, AU$18.4b). Will Google's driverless car spell the end of the pedestrian?